← Why is it necessary for Yahweh to save the physical remnant from Satan’s hand? The splitting of the Sanctuary – the split of Michael and Christ. A Savior, a destroyer. The Lion of Judah – Kingdom of Christ, the coming Millennium. Lion of Zion, Michael, the Wrath coming from Yahweh’s Throne. Those in the dark are not enlightened because they are not of Yahweh’s remnant. If we are from Satan, would Satan intentionally try to bring to ruin his own kingdom, or would he try to prevent as much ruin as possible? If Satan is responsible for all of the calamitous things befalling mankind in these end times, then Satan’s kingdom would be divided and fall from within. If that was truly the case, it would not be necessary for our Mother Yahweh to crush Satan’s kingdoms on this planet – they would self-destruct. But even so, If Yahweh did not intervene, mankind is a wild card, and though Satan tries his best to make his kingdom unified, mankind would eventually cause its own destruction with no outside help, but that would also destroy the remnant, so Yahweh’s intervention is imminent in not only saving Her children, but also in ending a cycle of evil that cannot be managed even by Satan whom started the spiritual war that has brought creation out of harmony. Matthew 12:26 “If Satan drives out Satan, he is divided against himself. How then will his kingdom stand?” Is Satan divided and fighting a war within himself, or is he fighting Yahweh’s forces to try and remain afloat? Even Christ understood that Satan does not work willfully in a manner that supports Yahweh’s efforts. And so, countless Scriptures give Yahweh’s mind-set about bringing Satan’s kingdom to ruin, and mankind is caught in the middle, therefore a separation work is being performed to see who sinks with Satan, and who else is redeemable. Reflecting the spiritual realm and not the earth: 2 Kings 19:31 “For a remnant will go out from Jerusalem, and survivors from Mount Zion. The zeal of the LORD of Hosts will accomplish this.” A remnant from spiritual Jerusalem – being those of humankind that are salvaged. The survivors of Mount Zion are the angelic warriors that survived the cleansing of the once great Joint Command that has become the Lions of Zion. They are so named because they were re-birthed from Yahweh’s own Court of existence to do Her Will. Psalm 2:6 “I have consecrated My King on Zion, My holy mountain.”– Yahweh took Christ onto Her holy mountain where Michael once resided. Michael no longer has a place on that holy mountain once he concludes his assigned task. But Christ’s kingdom is lessor than the rule of his Mother Israel / Yahweh, and because he is a Savior, he cannot also be a destroyer because he does not run sweet and sour. They do not mix. 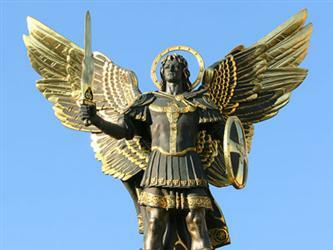 But Michael is warrior class, and he must finish the work he started before the Sacrifice which made him Christ Jesus. Prior to that, he was only Jesus in name, but then became the promised Christ in fulfillment. By splitting him off he was stripped of all violence that he was capable of performing and was literally transformed into a vessel of mercy and kindness. Michael however retained his warrior attributes that reflect Father Yahweh and not Mother Israel’s attributes. Jesus is MERCY, Michael is Wrath. It’s as simple as that. At the time of the splitting of the energy, Michael re-assumed his role as the Archangel / Great Prince of Yahweh, and this is why he is not given more prominence, because Christ is greater, and with the three it forms the unified 3 of the Ladder of Authority that placed Christ in the middle or second position. Though Michael is Great, he is lessor than Christ, and Christ is lessor than Yahweh. And with the 2nd position, Christ is the buffer for those that seek Yahweh, but Michael being in the 3rd position reveals that the wrath remains upon those that do not seek the 1st position holder by going through the 2nd, that being Christ. No one can come to Yahweh except thorough Christ Jesus, because he is the buffer. But the 3rd position of wrath is ever waiting at the door for those that are unworthy. Where does the LOZ and other truths spawn forth from? This is not merely the Word or Biblical books left for mankind, but the BOOK OF TRUTH that resides within the Great Hall of Records. It is a library that has recorded everything going on in creation. This entry was posted in Archangel Michael, Armageddon, Chris's Kingdom, Christ Jesus, Lions of Zion (LOZ), Satan / Dawn Lucifer, Spiritual War, Yahweh and tagged Archangel Michael, Armageddon, Christ Jesus, Christ's Kingdom, Lions of Zion, LOZ, Spiritual War, Yahweh. Bookmark the permalink.